Tarot Card Tricks? Are you nuts? Re: Tarot Card Tricks? Are you nuts? I believe in the power of the Tarot 100%. And I am dead (no pun intended) serious about that. As for their belief in me it all depends on the person being read. Some believe in it wholeheartedly, some half believe it and some don't believe in it at all. Or say they don't but they do really at some level. That is up to them. I never force the belief on someone. On the other hand I can't take risks and say things that will affect their lives in a negative manner. I am like a gardener. I plant seeds in their mind. However, I make sure that the seeds I plant are positive seeds. I see it as my duty to make sure to the best of my ability that the clients feel better for having met me. Sometimes I am not able to do this completely but I learned a long time ago that a little help can often be a lot of help. mark lewis wrote: YES! A thousand times yes! Really? You actually believe that you are predicting the future of your clients! Well we'll have to disagree on that. We can certainly agree to disagree. Are you saying you read tarot cards to predict the future but you don't actually believe in it yourself? That could be classed as deception or insincerity by some people. Even fraudulent. If you do a magic trick for people then you have to use deception but tarot cards are NOT a trick! It is an ancient method of divination. The very idea of "forcing" cards on people when doing readings fills me with horror. That is trickery rather than genuine divination. But each to his own I suppose. Of course tarot predicts the future. I get a ton of clients who come back, sometimes even years later, to inform me that the things I said come true. And they DO come true! And there is a reason they come true. A scientific and logical reason they come true. Not in every case certainly, but most of the time. That is why you should never predict death under ANY circumstance, heckler or not. You may plant a seed of fear in the subconscious mind of the client which over time tends to bring the thing to actually happen because of the well known psychological "self fulfilling prophecy" phenomena. And in fact this phenomena works in reverse too. If I predict something positive then that event is likely to happen because the subject will make it happen themselves. And that is WHY the tarot predicts the future. I do emphasise to the client that nothing is set in stone and I cannot be 100 percent perfect in my predictions. I explain that it is a bit like a weather forecast. A weather forecaster can predict it is going to rain next week but sometimes the forecaster can get it wrong and I can get it wrong too. However, most of the time the forecaster gets it right and so do I through the tarot. There are many theories as to why the Tarot works. And it works well. One theory is Jung's theory of synchronicity which I do not go along with. In other words the cards do not come up at random. I DO believe the cards come up at random but it is the reader that is responsible for the results rather than the cards themselves. 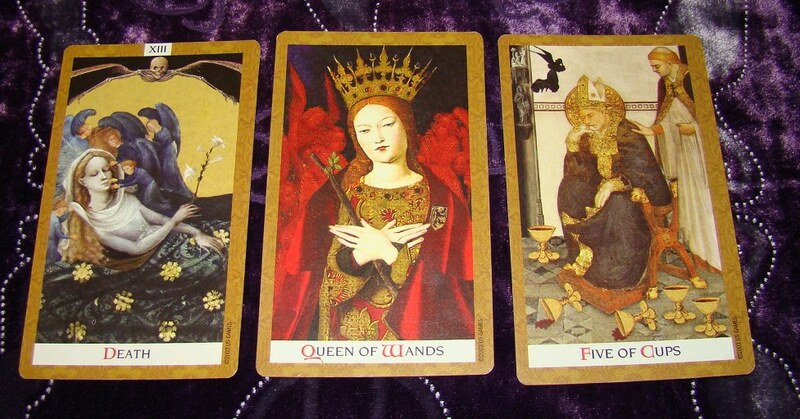 A reader plants the seeds of positivity according to the way he interprets the meanings of the cards. In other words the reason the prediction comes true is because of a partnership between the reader and the client. The reader interprets what he sees in a positive way and plants the seed. The client over time helps to grow, nurture and eventually sprout the seed. Unlike many magicians I do not do readings for "entertainment". There is nothing wrong with that kind of thing of course and I have no objection to it. Not everyone is capable of doing what I do and I can understand and appreciate that. However, what I do is serious stuff. Entertainment readings seem to be geared to "the man who knows" mentality of the magician/mentalist. 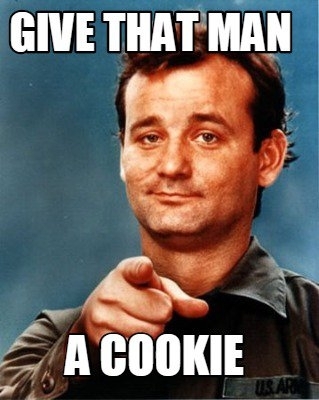 I try to work in "the man who cares" mentality. mark lewis wrote: We can certainly agree to disagree. Are you saying you read tarot cards to predict the future but you don't actually believe in it yourself? That could be classed as deception or insincerity by some people. Even fraudulent. If you do a magic trick for people then you have to use deception but tarot cards are NOT a trick! It is an ancient method of divination. I am an entertainer, and I am booked as an entertainer. Please do not imply that I am being fraudulent, that is a libellous statement, and I take that very seriously. This is not the time or place for an in-depth discussion on this subject, so we must simple disagree, but I do feel that you should not call me fraudulent. Thank you for your response. Please read my post again. I did not say that you were fraudulent. I said that "some people" would regard it as fraudulent. I personally do not regard it as so. I understand that you are an entertainer. The kind of people I am referring to are the people that I personally do readings for. They do not want "entertainment". They want somebody that believes in what they are doing and that can give them insight into their problems. If they were to discover the reader does not believe that the cards predict the future to some degree then they would indeed regard the reader as insincere and deceptive at best and fraudulent at worst. However, in an entertainment situation they are not paying for the reading since I assume the organiser of the event is doing that instead. So perhaps in that situation since they are not spending money themselves they will show some flexibility in the matter. And of course if they don't like the reading they will merely consider that it is worth what they have paid for it. But let us get back to the subject at hand. I repeat: You should NEVER predict death to ANYONE, whether entertainer or not. Nothing terribly entertaining about that. And it doesn't matter how obnoxious the person is. You don't know what is going on in that person's life. He may be ill. He may be suicidal. He may believe in the power of the tarot but is putting up a false front that he is a sceptic. He could well carry that thought in his mind for months after the event. I am sorry but I feel very strongly about this. You are dealing with people's lives whether entertainer or not. If you set up the self fulfilling prophecy in someone's head then you had better bloody well make sure it is a positive prophecy. I would STRONGLY advise you never ever to do that again. OK guys let's calm things down please, I don't want to have to lock the topic. Oh, I think the conversation has been perfectly civil! But since you are a reader yourself what is your own opinion about telling people, even hecklers, that they should be ready for departure into the spirit world rather sooner than they first thought? Far as I'm concerned, Black Hart didn't do anything wrong. That is because you do not know what is going in in his victim's mind. I do because I AM psychic! mark lewis wrote: That is because you do not know what is going in in his victim's mind. I do because I AM psychic! mark lewis wrote: Most magicians who do readings do short entertainment sessions and of course there is nothing wrong with that. However, I do very serious sessions lasting 30 minutes to an hour and know very well how readings can affect people. You can do a lot of good or you can do a lot of harm. Do you really believe that your readings are real and predict the future of your audience, and do they believe that you are able to predict their future? This makes me stop & think what a lay person would think of magic & (serious) tarot from the same performer/performance... Would it be expected, as just another mysterious thing on the fringes of their believability (<--- fails spell checker), or is it seen as just so much fun non-sense? Of course, a large enough audience would run the gamut, but what should an approach be? Me, I collect decks, tarot or otherwise, and I have a lot. I've done 'readings', but over the years I've found that there are 2 kinds of 'readers'; Technical, who read the box, and Intuitive, who use the imagery to more easily build impressions. As an amateur 'reader', I can't see a 'magic' performance and a tarot reading of any kind mixing. I can, however, see the tarot cards in regular card "tricks" (I hate saying it like that). For one thing, certain card illusions/sleights lend themselves to stories, and seeing just sleights is like watching the highlights of a sports game on the news-just the home runs, or a movie trailer where you see all the special effects. If you can build a story around an illusion, the tarot cards can really flesh out the skeleton, almost giving context. If you are clever, and use the right deck(s), the imagery can be used as characters/elements of that story. For those wondering, I am certainly not thinking of the bland Ryder-Waite most lay people have seen, or think of when you say "Tarot". Oh no! Last edited by Tap on Nov 2nd, '17, 23:00, edited 1 time in total. Not trying to win, just trying to lighten the mood. It's been an interesting post, with some strong feelings in both camps. Personally, I've never used tarot cards and don't think I ever will. I don't believe in anything supernatural, but there must be something deep in my subconscious that associates the tarot with evil. Same with Ouija boards. Like I say, I have no beliefs in that stuff, but somehow they still scare me a bit. You should be scared! Not because of the Tarot which is a wonderful tool but because of the incompetence of many of the readers out there. But not just the incompetence. There are out and out scam artists out there that have all sorts of evil tricks of the trade to part you from your money and very large sums of money at that. It is the operators you should be scared of rather than the tool itself. Tarot cards are a wonderful tool for divination but you have to know how to use it right and responsibly. Think of water. You can't live without it but you can also drown in it. Think of a kitchen knife. Very useful in the kitchen but you can also stab people with it. A reader is like a doctor. He can cure you but his medicine can kill you if he does not know what he is doing. As for the Ouija board I am actually against the awful things. It can affect the mental health of people if they play around with the damn things without supervision and don't know what they are doing. It may well be OK for an entertainer to use them if he knows what he is doing (and many of them don't) but harmful in the wrong context. Now I have only looked at Tap's latest post cursorily and will have a more thorough look later. However, I was amused when he said he couldn't see a magic performance mixing with tarot cards. He should see me at psychic fairs! I am doing the svengali deck and the Buddha through the table all day! In fact I use magic to sell the readings in the first place. Here is an example. This is at a flea market rather than a psychic fair but I use exactly the same procedure except for the worm and three card trick demonstration which I don't bring to psychic fairs. "Now I have only looked at Tap's latest post cursorily and will have a more thorough look later. However, I was amused when he said he couldn't see a magic performance mixing with tarot cards. He should see me at psychic fairs! I am doing the svengali deck and loud! the Buddha through the table all day!" That made me laugh out loud! Thinking unthoroughly (<--- not a real word), maybe I meant adding a tarot reading to a magic presentation, and not as you say, a magic presentation to a tarot reading?! I'd love to see your shtick! I guess it was natural for the discussion to go as far as actual readings, psychic abilities, and such (no Gypsy's Curse? ), but I really only intended to ask (as a person who does 95% cards) about the influence of a different deck on a performance, and of course the look of cards that match/enhance a themed/storied routine/illusion. I still think the overall unfamiliarity with tarot cards in general might make a spec not even realize them as such... You know, as far removed from bikes as possible! Most people are only familiar with the 'majors', but the minors are what I'd use in an illusion-card for card-Ace to King (depending on if self-working, the pages or knights can be removed, depending on your gender or just plain preference. That way, you have 4 x 13. I also have tried some flourishes (cuts & shuffles, no cardistry here) with my bigger cards, and what a huge difference! I feel like if I practice with borderless deviant moons, I can do ANYTHING with 2 1/2" x 3 1/2" !!! Large size (3.5 x 5.75") <--- What uses this size? P.S.S I also didn't consider the striking differences in the media itself. Most tarot decks are bland, low color palette, and smooth in finish (no air cushion dimpling?!). But some are truly works of art that drop jaws. I have old Marseilles decks that are gold gilded (gilded gold? 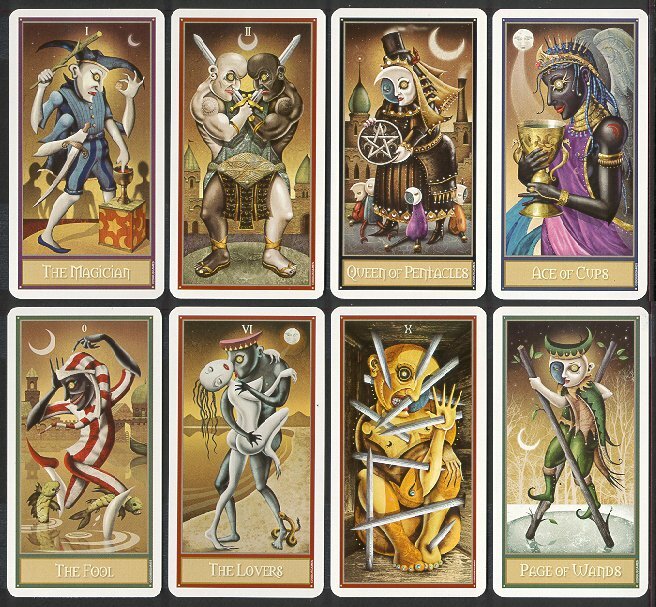 ), and if you can tolerate the heavy Christian/Catholic imagery, the absolutely astonishing Golden Tarot by Kat Black. Each card, majors & minors, is a composite of digitized artwork from art classics, a part from this, a part from that, with the snips put together to form striking imagery. You have to look closely to see that te images are actually parts of all kinds of other images. It took her YEARS to do all 78-and it shows. Not one part of any image is not from a period painting. When specs look at a tarot card, they surely feel differently. The 13/Death is a Major Arcana, but you get the point... Look 'em up!